Michel Vaillant is one of the honoured brontosauruses of Francophone comics. 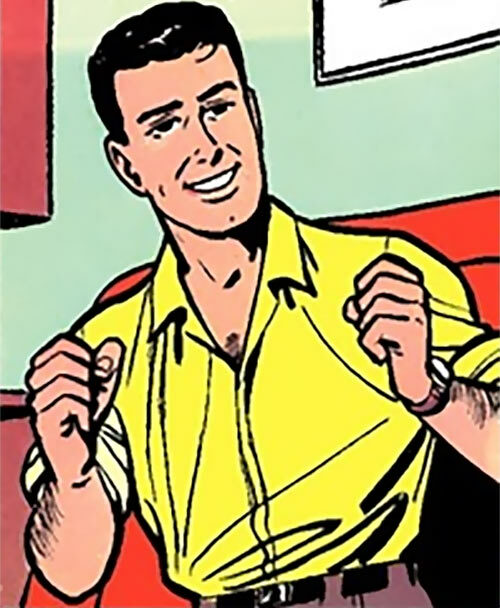 Short stories were published in comics magazines in 1957, but the series started in earnest in 1959. It was rebooted decades later after 70 graphic novels. Furthermore there was a TV series, an animated series, a movie, etc. 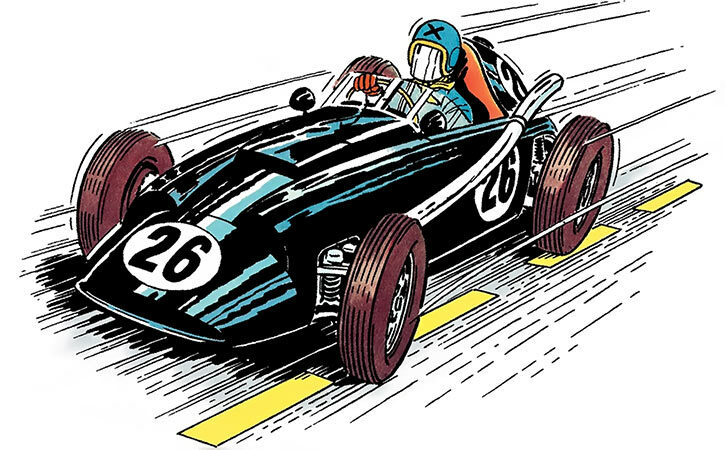 It’s a sports comics, about racing motorcars. So it goes “vroom” a lot. I think there was an obscure English translation once, but otherwise everything’s in French or Dutch. I’m not going to cover the whole of the material, obvs. Instead, this profile covers the first four graphic novels (1959/1962). These have the additional charm of age, especially when it comes to the vintage racing cars. Known Relatives: Jean-Pierre Vaillant (brother), Henri Vaillant (father), Madame Vaillant (unnamed mother), Agnès Vaillant née de Chanzy (sister-in-law), Benjamin Vaillant (uncle). Group Affiliation: Vaillante motorcar racing team. Base of Operations: Paris, France. Michel Vaillant is in exceptional physical shape. By late 1950s standards he follows a superb regimen. He spends a lot of time practicing soccer, apparatus gymnastics, tennis and judo. He also completely eschews alcohol and tobacco, which was rare back then. He has superb eyesight, keen reflexes and a superior endurance. He is also a gifted racing driver, and has just reached the point where he proves he’s among the greatest of his generation. Furthermore he’s a disciplined driver, well capable of gauging the risks he’s taking and of racing strategically. Vaillant isn’t half-bad with lighter speedboats. He also demonstrates superior skill with a Gendarmerie motorbike (a Terrot 500cm3 RDA , I’d imagine), and is clearly familiar with long-haul trucks driving. It’s obvious, I think… And yes, this tune’s a joke. Mostly. I hope. 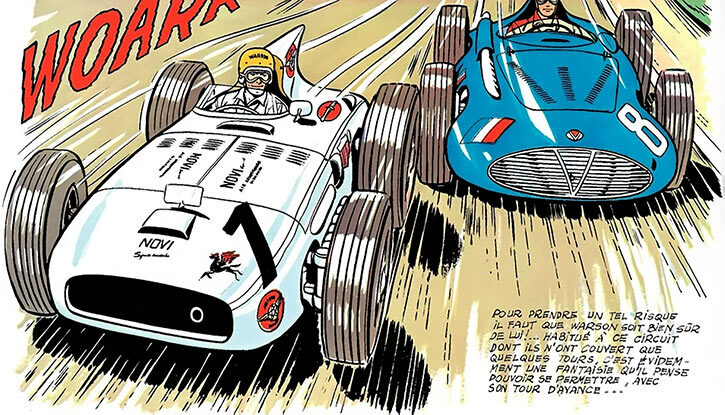 By 1959, Michel Vaillant is a young but promising race driver, apparently in his early 20s. He was the lead driver for Team Vaillante, a French auto builder run and presumably founded by his father. Michel’s brother Jean-Pierre was one of the engineers, and the second driver during endurance races. Michel also worked as a well-regarded auto and racing journalist. In his world, Vaillante is a B-list but still large cars manufacturer. Even back in those days, it had thousands of employees. It also had a significant media and top-of-mind presence, especially in France. During the late 1950s, US newspaper the New Indian took exception that the great Fangio had been repeatedly crowned as *World* Drivers’ Champion. It claimed that races such as the Indianapolis 500 were much tougher. But this didn’t really go anywhere. Yet this fabricated buzz resulted in good sales. 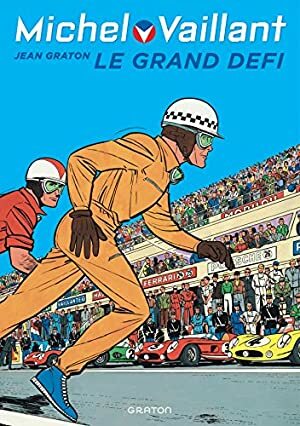 Wanting to get in on this action, a French newspaper organised a series of races between a European driver and US driver. This wasn’t commonly done back then, if only because of the duration for Transatlantic travel. Since the publisher was a friend of Henri Vaillant, Michel was picked as the European driver. Meanwhile the publisher of the New Indian picked Steve Warson as the US driver. Warson was very popular with the public, but hadn’t yet won the Indianapolis 500. The first contact between Vaillant and Warson, in New York City, didn’t go well. Having never visited the US, the Frenchmen knew little about the spectacle and mythologisation around American race drivers back then. The first race of the challenge took place in Buenos Aires. Warson took the lead, and Vaillant found himself stuck behind two Maserati during most of the race. These were deliberately blocking him. Due to cultural differences, the Frenchmen thought that Warson was behind this plot. This wasn’t actually the case – Warson was furious about it. The competitors deduced that the Maserati drivers had likely been paid by Argentine bookmakers to force the Vaillante to lose the race. 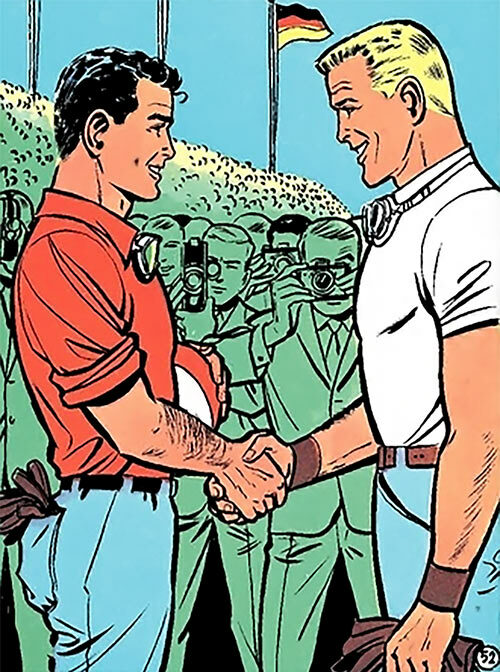 The next competition was the prestigious Indianapolis 500. Initially, Vaillant had trouble adapting to this peculiar race. Thus, he ended up in the last position and losing a lap to Warson, who was in the lead. But he stuck behind Warson, gradually working his way back to fourth. Within the final nine laps, an amused Watson let Vaillant overtake him. It had been a ruse. The Vaillante Grand Prix’s engine was much more powerful than Vaillant had let on. Soon, Vaillant and Warson were duelling at 170+ mph, beating the speed record for an Indianapolis lap. The Vaillante Grand Prix was pushed all the way to 180 mph. As he tried to match that, Warson’s Novi Special s engine caught fire. Vaillant thus won the Indy 500. However his engine was completely cooked, which superficially burned his face. The third race was at Francorchamps , for the Belgian Grand Prix. However, Vaillant was taken out by an exhaust leak. Freed by defective soldering, the carbon dioxide nearly knocked him out. British driver Peter Collins won the race. The fourth competition was at Le Mans, for France’s famous 24-hour endurance race. Warson was driving a Lister Jaguar , and Vaillant a Vaillante Le Mans. However, Warson didn’t pace himself right for this unusually long race. The Belgian Ferrari Testa Rossa driven by Swaters and Bianchi nearly won, but the Vaillante Le Mans narrowly overtook it. With this victory, Michel Vaillant and Steve Warson were evenly matched in the scoring system. The last race at the German Grand Prix — at Nüburgring — would thus be decisive. The race on this demanding circuit was remarkable. But Watson took excessive risks to pass Evanni’s Maserati and crashed his Vanwall . Vaillant narrowly beat Evanni, but continued racing to loop back to Warson’s crash site. Arriving shortly before the ambulance, Vaillant volunteered for a transfusion to save Warson’s life. Once Warson could leave the hospital, the Vaillants took him in so he could recover in the best conditions. That was because Warson had no living direct relatives, and was rather far from home. Michel then became the head of publicity for Vaillante, building upon his journalistic experience. In 1960, the Vaillants were in Monaco. Michel participated in a small powerboat race. Though he was a beginner, his father thought that Michel’s rep on land would help sell Vaillante maritime engines. However, the lad had to crash his vehicle into an out-of-control outboard to save another pilot’s life. Meanwhile, an anonymous driver, with a car from no known brand, was repeatedly spotted training on Formula One circuits. Driver X, wearing a then-high-tech mirrored visor helmet, was doing excellent lap times. The mysterious X then registered for the famous Monaco Grand Prix. Monaco became a duel between Vaillant and X. In one of this circuit’s demanding turns, X skidded out of control but quickly recovered. More powerful than the Vaillante, X’s mystery car even retook the lead. However, X threw the race at the last moment. He let Vaillant win. The Frenchman was furious about that. X handily won the next Francorchamps race, whereas the Vaillante was brought down by engine troubles. It was becoming clear that the Vaillante Grand Prix wasn’t state of-the-art anymore. A rumour also spread that X was a Soviet driver. But by the next Grand Prix, an actual Soviet team — driving Zvezdas — entered the European championship for the first time. Steve Warson also entered the championship driving a Novi, as the US government wanted to lessen the odds of a Soviet victory. Driver X was also present. The Soviets handily won at Reims. Vaillant crashed to avoid a crashing Aston Martin , and Driver X abandoned the race to make sure that Vaillant was OK. Warson performed poorly – like the Vaillante, his Novi wasn’t good enough anymore. As it turned out, Driver X had been Jean-Pierre Vaillant all along. Disagreeing with Henri Vaillant’s poor decision not to work on a new Formula One Vaillante, he had developed his own, skunkworks-style. The big mystery was in order not to make Vaillante look bad if the prototype didn’t work out, and the “mysteriously foreign” mechanics of Driver X were simply speaking… in Breton . Though Reims was lost, Jean-Pierre’s tests meant that Vaillante now had a powerful, brand-new F1 design. Two were built in time for the next Monza race. Team Vaillante recruited Steve Warson as a second pilot, since the Novi clearly couldn’t compete in European races. Monza was a double Vaillante victory, as the Soviet drivers were much less familiar with the circuit than with Reims’. The excellent performances of the Russian F1s, and the poor showing of US-made cars in European races, inspired the Soviets. They decided to challenge American car makers to a road race. By this point the international renown of US brands was beginning to fade. Thus, a commercial offensive of Soviet car makers was credible – to Henri Vaillant’s dismay. Steve Warson driving a Novi Special in Indianapolis. Vaillant seized the initiative. He offered an alliance with Ferrari, Aston Martin, Vanwall, Porsche, Jaguar, Mercedes and Maserati. These would organise a varied set of three major races, inviting Americans and Soviet competitors. After much negotiation an European, a US and a Soviet team were assembled, all driving multiple brands. The races would take place at Sebring (Florida), in Spain, and in Poland. Vaillant won the American-style 12-hour race at Sebring. Warson came second on a Corvette S.S. , Berckman (European team) third on a Lister-Jaguar, and Nassiev (Soviet Team) fourth on a Volga . The US team then invited everyone to visit the brand new circuits at Daytona, where Michel established an unofficial record with a Formula One Scarab . The Gran Turismo race took place in Spain – San Sebastian to Barcelona, via Madrid and Toledo. One of the European cars was the brand new Vaillante Ouragan. But the race would clearly be demanding, taking a nasty toll on both the drivers and the cars. Furthermore, somebody was sabotaging the European team. At Sebring, one of the European pilots had been poisoned. Nothing fatal, but enough to have almost caused an accident as he spaced out. And in Spain, somebody broke into the garages and sabotaged several cars. Thus, the European drivers feared that their cars could break down at any point. And indeed, von Richter’s Porsche Carrera , subtly sabotaged, crashed with nearly fatal consequences. Michel also nearly died due to the poor maintenance of Spanish roads. However, locals ran in to help him get his car back on the road, and he thus finished fourth. It was Jean-Pierre Vaillant’s wife Agnès who discovered the truth. One of the British mechanics was an impostor. He was the father of a pilot killed in a racing accident, and he wrongly blamed von Richter for this. The sabotage at Sebring had accidentally affected the wrong man, and the crude sabotages in San Sebastian were meant to cover for the much subtler sabotage of von Richter’s Carrera. In Warsaw, the European drivers thus could compete in a Formula One race without fear of sabotage. Von Richter having a broken arm, he was replaced by a Dutch colleague. In the end it was a clear European victory, with the US and USSR teams ending up within one point of each other. Meanwhile, Japanese automakers were still obscure entities working for their developing domestic market. In 1962, Benjamin Vaillant asked his nephew to talk with a teenager named Yves Douléac. Yves was the son of one of Benjamin’s truckers, who had died in a traffic accident. Thus, Benjamin felt responsible for Yves, and had given him a small job with his trucking company. But Yves had become bitter, and seemed involved in shady business that would earn much more money. Since Yves used to idolise Michel Vaillant, it was hoped that a talk with him could prevent him from making a mistake. Michel investigated, with Steve Warson’s help. The American was taking a vacation in France, and would soon join Team Vaillante. He also seized the occasion to learn to drive long-haul Vaillante trucks. The investigation slowly unearthed that Régis, the unruly son of a rival trucking company, was under the mob’s thumb. This rival was also using a more modern and more exploitative business model of truck ownership by drivers to quickly expand. Thus, it was taking market shares away from Benjamin Vaillant’s more staid operation. 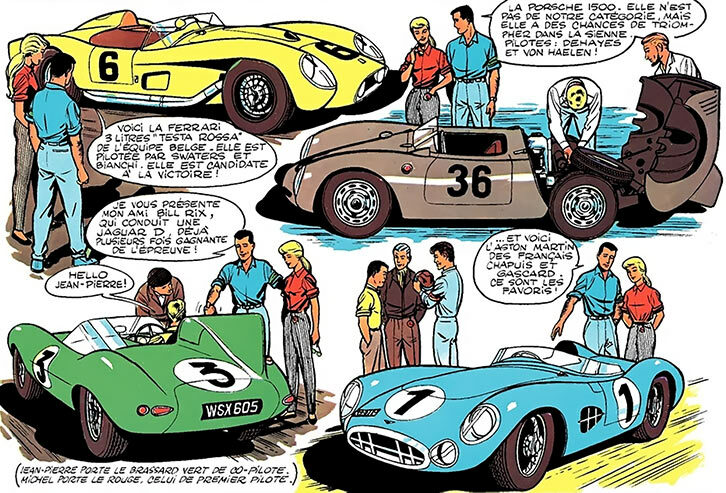 Late 1950s racing cars at Le Mans. Click for a larger version. It was accidentally discovered that the truck Yves was helping with was ferrying weapons. The driver was captured by the mob to prevent him from talking, but Yves escaped and warned Michel. Vaillant and Warson took on a bunch of thugs and rescued the trucker, but the mobster they were after escaped. The gendarmerie had been deployed, and Michel Vaillant convinced the owner of Night Haul Radio to have his listeners join the dragnet. Between the irate nocturnal truckers, the police motorcyclists and Vaillant, the criminals were eventually intercepted and arrested. By this point, Michel was finishing setting up the Vaillante School, an apprenticeship program in the auto industry. Yves Douléac, who wanted to become a race driver, was an early recruit. He also cut his vaguely long hair and renounced his black leather jacket, as all honest 1962 lads should ! A handsome hero with black hair and a small spit curl. He’s not that tall or bulky, but he’s manifestly athletic. Michel tans easily. After a few days in the sun he’s drawn with the same complexion as his Italian or Argentine colleagues. Lessee, 1959 France… oh yes, Guy Béart. This is extremely 1959 Boy Scout fare (and so’s the sound quality). Available for download on Amazon, somehow . Michel lives for racing. However, he is also a gentleman. Competition is a pleasure, not an end. He loves speed and duels of skill, not beating others. In general, he seriously upholds the de Coubertin spirit of sportsmanship. However, it is also important that he wins to raise the profile of the Vaillante brand. When he gets downtime after a race, Michel is a big fan of seaside vacations in the Mediterranean sun. The Vaillants have a large coastal villa near Menton, not far from the Italian border. He is so virtuous as to practically be a saint, and he’s the role-model for all good Catholic sons. Joseph the lead mechanic, Mr. Vaillant, Mrs. Vaillant, Michel, Agnès, Jean-Pierre, and Steve Warson. The Vaillant family is an idealised version of a Catholic French family of these times. So it has a hard-working and authoritative father, a mother who exists to support the rest, and two pious, dutiful Boy Scouts sons. The Vaillant clan is tightly-knit. It works tirelessly to ensure the success of the familial company through their high-profile racing team. There’s no reason not to have him. Steve Warson could be renamed Steve Carson, and be the brother of the famous speleologist. Dex: 03 Str: 02 Bod: 04 Motivation: Good son. Int: 04 Wil: 04 Min: 04 Occupation: Race driver. Vehicles (Water) only for motorboats. 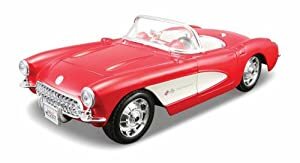 Buddy (Steve Warson), Credentials (Vaillante automaker, High), Expertise (Motorcar racing lore), Familiarity (Line fishing), Language (French-accented English), Local Hero (French motorcar racing fans). Steve has roughly the same stats as Michel, but half as many HPs. He lacks the Artist Skill and the Martial Artist Techniques Subskill, but he has STR 03. Before being a race driver, Warson was a middleweight college boxing champ. And he’s always up for demonstrating these talents ! Warson is emblematic of the figure of the “doughty Anglo-Saxon adventuring buddy” that was common in period Francophone pop fiction. 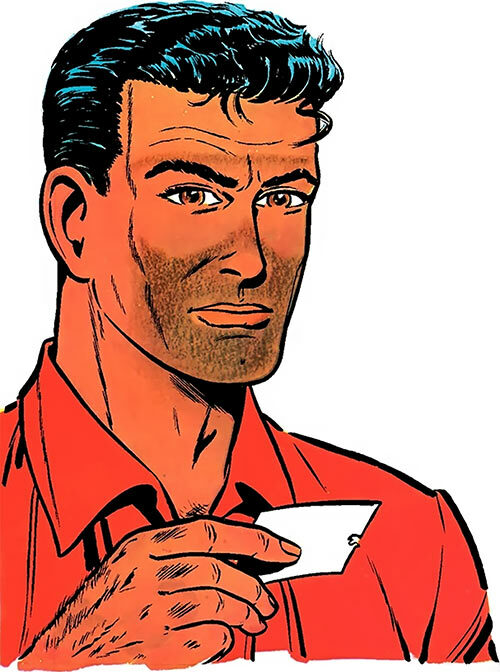 The other big example is Bob Morane’s buddy Bill Ballantine. Source of Character: Earliest four Michael Vaillant GNs. Writeup completed on the 14th of January, 2018. Michel Vaillant and Steve Warson.